I am off to New Jersey for the weekend to speak at this homeschool conference. The conference will be on Saturday at a place called Mater Ecclesiae in Berlin, New Jersey. Berlin is right across the river from Philadelphia, so if you are in the Philly area or northern New Jersey, consider coming out to Mater Ecclesiae this Saturday. I'm giving a 45 minute talk on Catholic historiography and how to teach history to kids in a way that is interesting and memorable. I'll post the transcript of the talk and details about the conference when I get back on Monday. 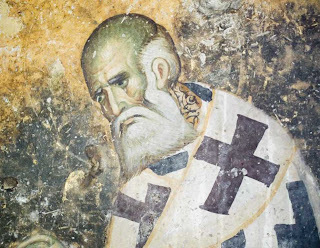 It is with great sadness that I heard of the departure of Ryan Grant, a.k.a, Athanasius, from the blogosphere. 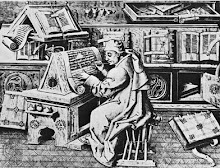 Besides being a knowledgeable and charitable man of tremendous erudition, his blog, Athanasius Contra Mundum, was also the first Catholic blog I ever started following and was in fact my inspiration to start up this blog in 2007. Ryan explains his reasons for taking down his blog here. Please pray for him; I cannot begin to express how I feel about this loss - when I compare my blog to his, mine looks so juvenile that I feel ashamed to be counted in his illustrious company. Well, this encomium as gone on long enough; Ryan would probably slap me if he were here. Thanks Athanasius for years of great work dedicated to the triumph of Tradition. Let us all raise a pipe to you this evening in mourning even as we say a prayer for you in hope. "I have something to give you!" my next-door neighbor's wife said excitedly as she went out to her car yesterday evening. I had come over to the neighbor's house for the rather dull purpose of borrowing a very specific type of screw driver (the very dinky kind that you can work on a circuit board with). It was while he rummaged around looking for the screw driver that his wife said she had something for me and went out to her car. She returned momentarily with a small postcard sized flier for her church. "I wanted to invite you guys to our Easter service - it's phenomenal," she said with obvious and sincere excitement. I recognized this church; it was a non-denominational "seeker friendly" church, the kind that are now popping up all over the place where the pastor where's blue jeans, there are multi-media productions involving dance and drama, and the service (or "Weekend Experience" as this church refers to their service) is highly emotional. I told her politely that we always went to the Catholic Vigil Mass for Easter at our own parish with our family and probably would not attend (I threw in the "probably" just to be polite). She pressed me, however, pointing out on the card that there were five different service times for the weekend and day care so we could dump off our kids. Then she said something that made my heart ache. She told me, "It's going to be phenomenal. We went to their Christmas program and it was amazing; I can only imagine how great the Easter program will be!" I asked her how long she had been at this church and she said, "Only a year. We were going to St. Mary Magdalen before [a nearby Catholic parish], but we got absolutely nothing out of it." Here she made a sour face, as if the bad experience at the Catholic parish at left a palpable bad flavor in her mouth. 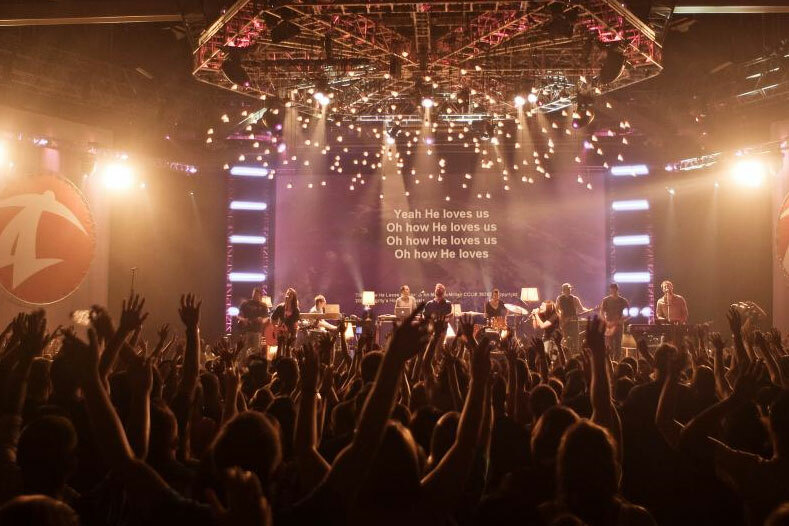 "This church is totally different; it's life-changing!" Well, I was devastated. Another casualty of the Catholic identity wars standing before me. The parish she mentioned being disappointed with is known as the most progressive in town, with a resurrected Jesus instead of a crucifix (or a "Resurrectifix"), no kneelers whatsoever, Protestantized rock music, and, according to their parish "vision statement", reaching out "to other faiths, cultures and traditions. Through shared friendship and service we hope to foster understanding and peace." I knew that the reason she had been so let down by this parish was because it offered her absolutely nothing of substance. She had been attending this parish for years without deriving any spiritual benefit from it. Apparently, hearing that I was going to the Catholic Mass for Easter, she simply assumed that my own Catholic experience was as unrewarding as her own. I should have gave her some response. I should have talked about the Mass, or why we are Catholic, or that I had fooled around in these churches before when I was a young adult and found them completely empty. Unfortunately I made no such response. I was too taken off guard; I was in the middle of repairing something and came over to borrow a screw driver and was absolutely not prepared to talk about the subject, so in the end I simply thanked her for thinking of us, told her we "most likely" would not come and parted company. I should have really gotten into a discussion or counter-invited her to our parish for Easter. Heck, perhaps if I had really fulfilled the Gospel and invited them at least a year prior they might not have winded up as non-practicing Catholics in this "seeker sensitive" church. Well, I have only myself to blame for that. We had talked about faith-related things before with them, like homeschooling and the blessings of children and whatnot, but neither my wife nor I had taken the next step to actually invite them to Mass. From the sound of it, an invitation to Mass might have not gone over well anyway, since their experience of Mass at their progressive parish was do putrid. But, who knows. I shall try, by God's grace, to rectify this omission and not make the same mistake again. I do lay part of the blame on the progressive parish they went to. After all, ideally, if they were already attending a Catholic parish and were practicing their faith, I wouldn't have to be concerned enough about them to have to invite them to my own parish. But, as it is, they received nothing whatsoever from their Catholic parish. Now, while there is never a valid excuse for a Catholic to actually leave the Church, I think the Church definitely bears some of the responsibility. After all, if people come looking for a transcendent experience of God and the liturgy as celebrated gives them nothing, who's fault is it? They came looking for God and were given a man-made sham; they came asking for bread and were given scorpions. They asked for an egg and were given a stone. 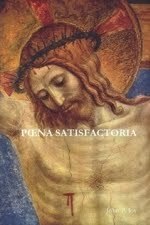 Some popular Catholic apologists put all the blame squarely on the persons who finally get sucked into other churches. In a talk called I'm Not Being Fed, for example, speaker and author Jeff Cavins makes the case that in scenarios like the one described above, my neighbors would be entirely to blame because they failed to take ownership of their faith and educate themselves about why they were Catholic and what Catholics believe. This is partially true, as in the end, everybody ultimately has responsibility for the state of their own soul. But we cannot simply ignore the other side of the equation; we cannot just shrug at heterodox priests, lame liturgies, banal homilies, non-existent catechesis, defective, man-centered spiritualities, worship experiences totally devoid of any transcendent element, near heretical preaching and then blame the parishioners for being ignorant and wanting something more. Sure, learning about your faith is an uphill struggle; but the incline can become so steep that we start to wonder if something is wrong with the hill. We have a situation in which uneducated Catholics are thrown into the worst possible spiritual and intellectual climate imaginable and then blame them for not growing. We are facing increasing turmoil in our nation and our world as it becomes painfully apparent that the West cannot sustain the level of spending we have been accustomed to for the past sixty years due to the ever-growing specter of an unsustainable level of debt. This truth is played out daily in the arguments going on in the Senate and House about the debt ceiling and spending cuts and in the European Union by disputes and riots over "austerity measures." It is not intention here to take sides on these issues or propose a solution; quite honestly, I don't believe there is a tenable solution that doesn't involve dramatic lifestyle changes and a lower standard of living. My intention is to merely point out that we have reached a turning point, or rather I should say a tipping point, from which there can be no return. We have known for decades that health care needed "reform." We have known for decades that Medicare, Medicaid and Social Security, huge unfunded liabilities, had the potential to cause serious problems for us fiscally down the line. We have known forever that America has huge trade deficits, budget gaps and an unsustainable level of debt. We have known for decades that our tax system is in serious need of reform and that our public schools are in free fall. What is new then about this current state of malaise, and why is this moment so unique? Because nobody really wants to solve a problem until it becomes a crisis. We knew about all our problems for decades but never had the stomach to do anything about them, because it was always easier to keep on living in debt and maintaining our artificially inflated standard of living for another year or two. When bad times did come, like the 81 recession, the S&L crisis, the recession of 90-91, the dot com bubble or any similar setback, we failed to significantly address the root causes of these calamities and instead allowed ourselves to return to the status quo. It was easier to do nothing than to change. This is a farce we can no longer maintain, and people are starting to realize it. We are realizing that the time has come where fiscal discipline must be restored or else we collapse; we must change or we will die. Politicians are scrambling to fix our problems, each along their own partisan ideological lines, although the time when change could have come more painlessly is long gone. We have reached what I call the "Pertinax Moment." Pertinax was a Roman emperor who ruled briefly in 193 AD following the assassination of Commodus. Commodus, though a tyrant, paid little attention to Roman military affairs and allowed the frontier fortresses to fall into a state of neglect and allowed the legions to slip into laxity. He patronized the Praetorian Guard with large sums of money and likewise allowed their discipline to falter. He increased the grain dole to the people and expanded the size and role of the Roman welfare state with his lavish games and spectacles. He further brought on a succession crisis, as he was too paranoid to name a successor while still living, as his father and the four emperors before him had done to ensure a stable transition of government. Rome prospered in the 2nd century only because her emperors were just and wise, but the system itself was more fragile than the emperors knew, as would be discovered after Commodus died without an heir. "[Pertinax] obtained all the customary titles pertaining to that office, and also a new one to indicate his wish to be democratic; for he was styled Chief of the Senate in accordance with the ancient practice. He at once reduced to order everything that had previously been irregular and confused; for he showed not only humaneness and integrity in the imperial administrations, but also the most economical management and the most careful consideration for the public welfare. Besides doing everything else that a good emperor should do, he removed the stigma attaching to those who had been unjustly put to death, and he furthermore took oath that he would never sanction such a penalty. And immediately some bewailed their relatives and others their friends with mingled tears and joy, even these exhibitions of emotion not having been permitted formerly. After this they exhumed the bodies, some of which were found intact and some in fragments, according to the manner of death or the lapse of time in each case; and after duly arranging them, they deposited them in their ancestral tombs" (Roman History, 74:5). "Since, now, neither the soldiers were allowed to plunder any longer nor the imperial freedmen to indulge in lewdness, they both hated him bitterly. The freedmen, for their part, attempted no revolt, being unarmed; but the Pretorian troops and Laetus formed a plot against him...two hundred, bolder than their fellows, actually invaded the palace with drawn swords. Pertinax had no warning of their approach until they were already up on the hill; then his wife rushed in and informed him of what had happened. On learning this he behaved in a manner that one will call noble, or senseless, or whatever one pleases...hoping to overawe them by his appearance and to win them over by his words, he went to meet the approaching band, which was already inside the palace; for no one of their fellow-soldiers had barred the way, and the porters and other freedmen, so far from making any door fast, had actually opened absolutely all the entrances. The soldiers on seeing him were at first abashed, all save one, and kept their eyes on the ground, and they thrust their swords back into their scabbards; but that one man leaped forward, exclaiming, "The soldiers have sent you this sword," and forthwith fell upon him and wounded him. Than his comrades no longer held back, but struck down their emperor...The soldiers cut off the head of Pertinax and fastened it on a spear, glorying in the deed. Thus did Pertinax, who undertook to restore everything in a moment, come to his end. He failed to comprehend, though a man of wide practical experience, that one cannot with safety reform everything at once, and that the restoration of a state, in particular, requires both time and wisdom. He had lived sixty-seven years, lacking four months and three days, and had reigned eighty-seven days (Roman History 74:8-10). Of course, after Pertinax comes the tyranny of Severus and Caracalla, and then right on into the Crisis of the Third Century. Pertinax's brief reign was truly the tipping point for the empire. It could never recover from the chaos that ensued after his reign and the problems he sought to address only got worse under his successors. Pertinax wished to reform Rome, but the time had long passed when such a reform was possible. The Praetorians had gone on so long in their position that there was no more returning to discipline. 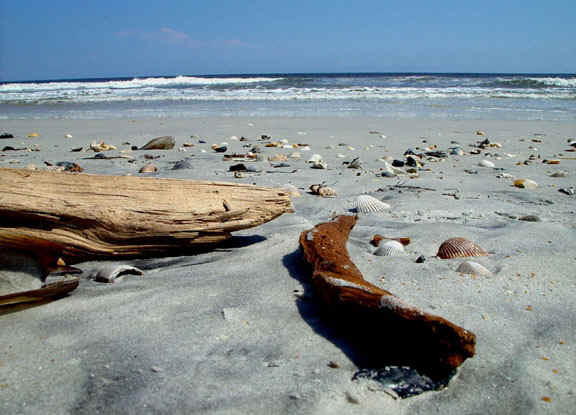 Most telling of all are Cassius' words that Pertinax "undertook to restore everything in a moment." This is the moment we have reached in our society I believe: the time when prudent leaders see that it is necessary to do something, but that we have become so accustomed to our privileges and manner of living that our populace will not tolerate any real change, just as the Praetorians refused to have any of the reforms that Pertinax entertained. Our civilization has reached its Pertinax Moment, the time when it is evident that change is direly needed but the people no longer have the stomach for discipline. Am I writing this to support any particular political party's program? Not at all. The budget wrangling is stupid, arguing over $38 billion in cuts when the government incurs $4 billion of debt per day. The fighting between the Democrats and the Republicans on these matters is simply a sign that everybody knows we must do something - but as Pertinax found out, we cannot correct the misgovernance of decades in a day, nor will our people stand for it. We no longer tolerate good government; in fact, it has been so long since we had it that we wouldn't even recognize it if we had it. Let's offer prayers up for our country and civilization this Holy Week. Blessings. 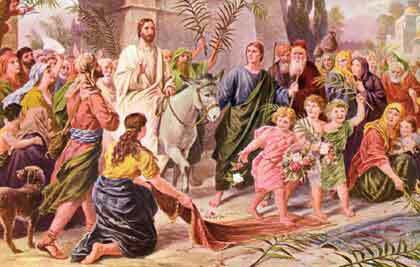 Happy Palm Sunday! Here is a very informative post I did from last year on the Old Testament background to what happened on Palm Sunday. By the way, those of you who subscribe to this blog probably noticed a slurry of eight or nine posts that went up last night. I apologize for this blitzkrieg of posting; these are all old posts that were formerly on Athanasius Contra Mundum. But, as I hear on good authority that this blog will probably be shut down after Easter, I removed them to this blog so they could be preserved. Too often, when every other attack by liturgical progressives has been exhausted, we get the absurd old argument trotted out that reverent celebrations of the liturgy are too triumphalist and unconcerned about the poor. This is a technique they pick up from the political left - that of attempting to establish a monopoly on care of the poor. Of course, everybody who is a true Christian cares about the poor. But if you do not care about the poor in the manner they think best, then you are accused of not being sensitive to the plight of the needy. I didn't think this debate about who really cares about the poor could come into the discussion of the sacred liturgy, but it has been brought up by progressives who think that Masses that are reverent are too "vertical" and thus not concerned enough with human-to-human relations, especially relating to the scourge of poverty. There is very often a false dichotomy brought up between good liturgy and service to the poor - missionary priests preaching on behalf of the poor are often the worst abusers, and as mentioned above, those who care about reverence are accused of being cold to the poor. What can be said about this accusation? 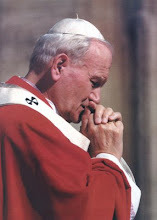 "In order to fulfill the New Evangelization, we have two extraordinary means: beauty and novelty. The beauty of Christian heritage, which is constantly being rediscovered through all of Europe, and the always effacacious novelty of the Grace of the Holy Spirit" (29 Jan, 2004). I would have chosen a better word than "novelty" to describe the movements of the Holy Spirit, but I get his point. At any rate, he says that it is the "beauty of the Christian heritage" which is leading to a rediscovery of the faith throughout Europe. To understand the argument for liturgical excellence, we have to see beauty as essential to the liturgy rather than extrinsic. 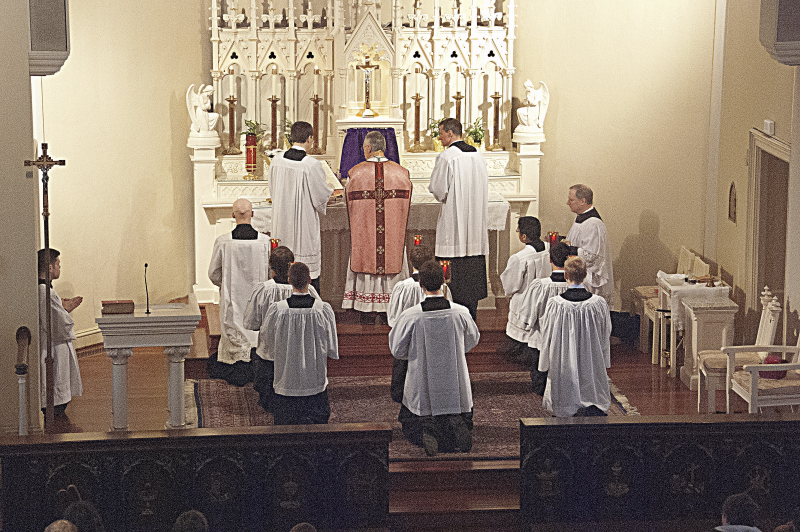 This is not hard once we have established the liturgy as being principally about God. 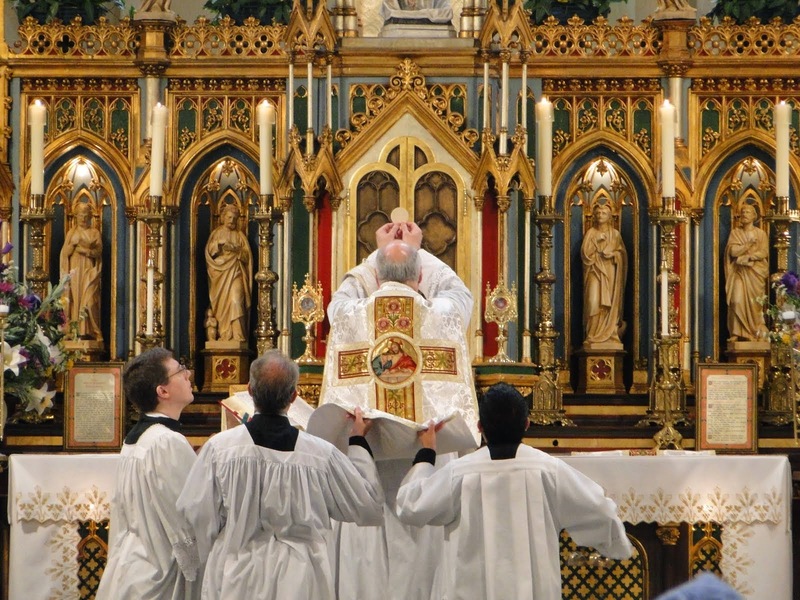 The excellence demanded of a reverent liturgy is not for the benefit of the priests, or for us (well, indirectly it is insofar as we are able to better participate in the liturgy). It is about worshipping God, and part of worshipping God should be coming into contact with mystery and transcendence, which human kind approaches through beauty. Thus, to deprive the liturgy of beauty is to deprive men of one the most common and universal means of approaching God. When we minimize our liturgies in hopes of making them more accesible to the poor, we actually rob the poor of the one free access to beauty that they have available to them, and thus shut off another door by which the poor can come in contact with the divine mystery. 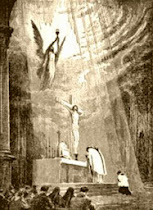 Liturgically minimalist Masses do no good for anybody, neither the well-to-do, for whom it just reinforces them in their complacency, or the poor, for whose sake these are ostensibly carried out. Next month my family and I are going down to Sarasota, Florida for a week and a half to stay with some family. Can anyone give me some recommendations of parishes to attend in the Sarasota-Bradenton area for Sunday and daily masses? The Extraordinary Form would be nice, but a reverent Novus Ordo would be fine as well. Last time we went to Sarasota we just went to the first Catholic Church we found in the phone book and wound up at some weird, roundish-shaped parish that was fairly progressive. Can anyone offer any input so this doesn't happen to us again? Also acceptable would be a Uniate, Ukrainian, Maronite or Chaldean rite parish. I'm sure I could just Google these things, but just googling parishes and looking at their websites doesn't give you the kind of feedback that individuals can provide. I just got through with a really great article from an old edition of Koinonia, a journal of the Princeton Theological Forum, on the problem of Cathar apocalypticism, or rather I should say the mysterious lack of it. The basic problem is surrounding Cathar apocalypticism is that, despite the fact that the medieval world was a world in a constant state of eschatological expectation, and despite the fact that almost all of the other notable medieval heretical movements were shot through with eschatological apocalypticism, the Cathar system was notably lacking in any sort of apocalyptic fervor that characterized so much of medieval society. Why did the largest and most organized heresy of the Middle Ages fail ultimately to produce any apocalyptic strain, something that was present in other heretical movements as well as in orthodox Catholicism? To the best of my poor ability will I endeavor to condense seventeen pages of the original article into a few paragraphs here. Those interested in medieval heresy and the Cathars in particular should definitely read the original article, which draws on some very important (but not very well known) primary sources from the Cathars themselves. 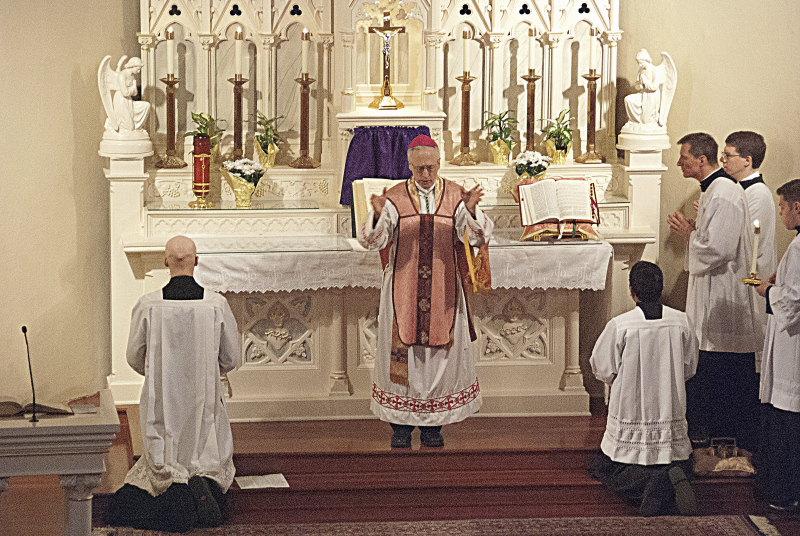 Here is something you definitely don't see every day - on Laetare Sunday, our Bishop, His Excellency Earl Boyea, came to say Mass according to the Extraordinary Form in our parish. Before being elevated to the bishopric of Lansing, Bishop Boyea was a proponent of the Traditional Mass as Auxiliary Bishop of Detroit and used to say it monthly at the St. Josaphat-Sweetest Heart of Mart cluster. 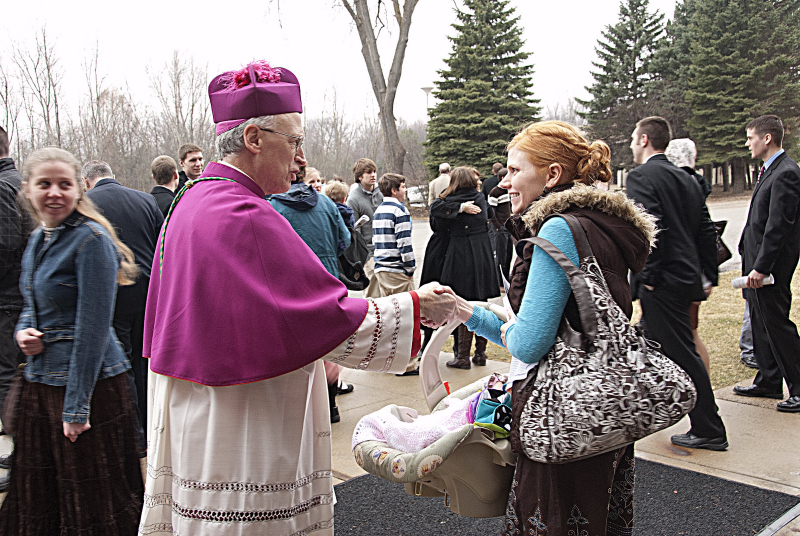 It was really awesome to be able to assist at an EF Mass said by a bishop. The church was absolutely packed; I spent the whole Mass standing (and kneeling) in the vestibule. Here are some pictures. 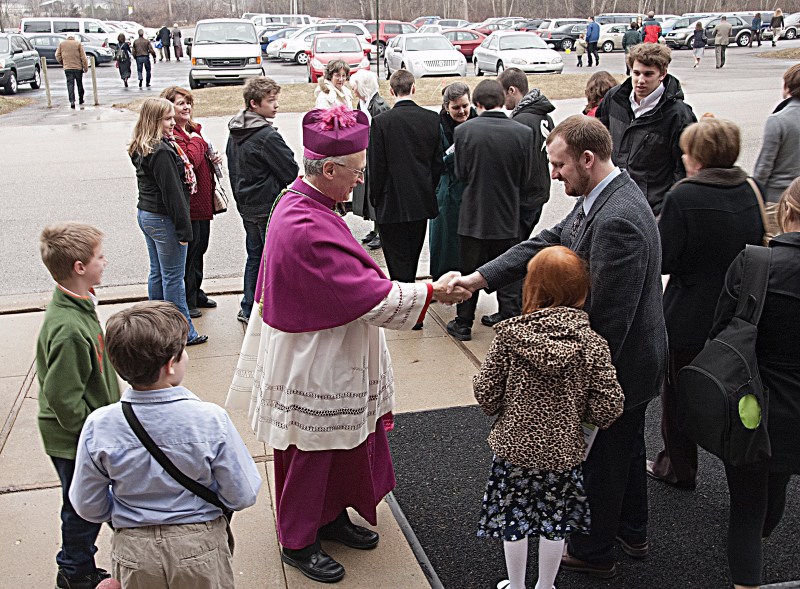 The third one is of myself and my daughter greeting the bishop; the fourth one is my wife. Dei Verbum 11. Few Conciliar documents give me more headaches than this one passage out of the Constitution on Divine Revelation. The passage states that the Bible "teaches, without error that truth which God wanted put into the sacred writings for the sake of our salvation." As we know, this passage is universally misapplied by modern Scripture scholars to mean that only those things pertaining to salvation can be considered to be truly inspired. Nor is this interpretation made by liberal or modernist scholars either; otherwise orthodox Scripture scholars read the document the same way. Back when I was at Ave Maria, our professor of Sacred Scripture (who happened to be the Academic Dean and is still employed by AMU) had us read Dei Verbum and told us that only those parts of the Scriptures that pertained to faith and morals could be considered inspired, and therefore infallible. When I objected and stated that he was misinterpreting Dei Verbum 11, he looked at me blankly and said that he was "not aware of any other interpretation." Reading any of the other pre-Vatican II Magisterial documents that treated on Scripture study would have put the passage in context; apparently this professor had never read them. 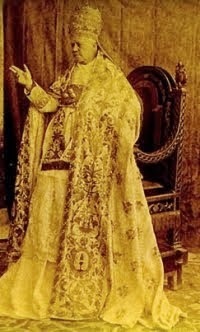 When we read other documents, especially Providentissimus Deus of Leo XIII, we see that the correct way to interpret Dei Verbum's "for the sake of our salvation" passage is that the Bible is immune from error in everything it says, and everything it says God wanted there for the sake of our salvation. If Dei Verbum 11 is problematic, this passage is downright useless. With such qualifying statements as "might" and "only", we are left wondering if there is any way to tell what is inspired and what isn't. Clearly, the Synod was leaning more towards the liberal intepretation of Dei Verbum (thankfully this document never turned into an encyclical). This should serve as a sober reminder of how widespread this narrow view of inspiration is in the Church. (Chicago: Franciscan Herald Press, 1967), 188. For my own part I think that this question must be answered affirmatively, that is, that these 'background' events also are described without error. In fact, we declare in general that there is no limit set to this inerrancy, and that it applies to all that the inspired writer, and therefore all that the Holy Spirit by his means, affirms.... 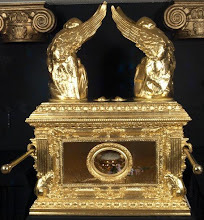 This thought, which re-occurs in various forms in the recent documents of the Magisterium of the Church is here clearly understood in a sense which excludes the possibility of the Scriptures containing any statement contrary to the reality of the facts. 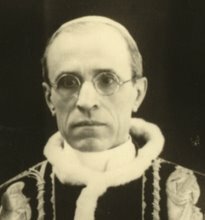 In particular, these documents of the Magisterium require us to recognize that Scripture gives a true account of events, naturally not in the sense that it always offers a complete and scientifically studied account, but in the sense that what is asserted in Scripture - even if it does not offer a complete picture - never contradicts the reality of the fact. If therefore the Council had wished to introduce here a new conception, different from that presented in these recent documents of the supreme teaching authority, which reflects the beliefs of the early fathers, it would have had to state this clearly and explicitly. Let us now ask whether there may be any indications to suggest such a restricted interpretation of inerrancy. The answer is decidedly negative. There is not the slightest sign of any such indication. On the contrary everything points against a restrictive interpretation." 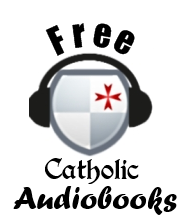 From Cardinal Bea's commentary we can see that the use of the adjective "saving" was considered too ambiguous; unfortunately, the final phrase, "for the sake of our salvation" nostrae salutis causa) proved equally problematic. We see that the use of this concept of "saving truth" was disputed from the very beginning. It was necessary for man's salvation that there should be a knowledge revealed by God besides philosophical science built up by human reason. Firstly, indeed, because man is directed to God, as to an end that surpasses the grasp of his reason: "The eye hath not seen, O God, besides Thee, what things Thou hast prepared for them that wait for Thee" (Isaiah 64:4). But the end must first be known by men who are to direct their thoughts and actions to the end. Hence it was necessary for the salvation of man that certain truths which exceed human reason should be made known to him by divine revelation. Even as regards those truths about God which human reason could have discovered, it was necessary that man should be taught by a divine revelation; because the truth about God such as reason could discover, would only be known by a few, and that after a long time, and with the admixture of many errors. Whereas man's whole salvation, which is in God, depends upon the knowledge of this truth. Therefore, in order that the salvation of men might be brought about more fitly and more surely, it was necessary that they should be taught divine truths by divine revelation. It was therefore necessary that besides philosophical science built up by reason, there should be a sacred science learned through revelation (STh, I. Q. 1 A. 1). 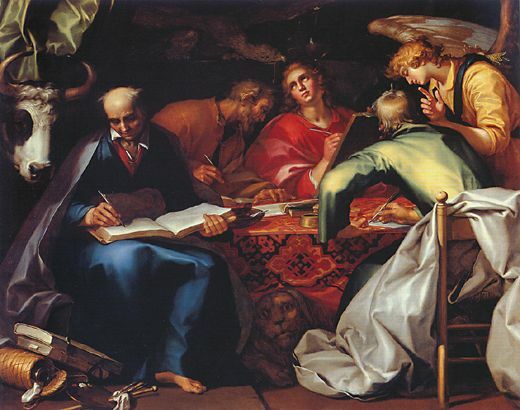 This is what Dei Verbum was getting it - it is not the specifically the content of Scripture that it is referring to when it says "for the sake of our salvation," but the fact of Divine Revelation: because God willed to save us, He graciously and condescendingly chose to impart to us such truths as we could not have known without His revealing them to us. Of course, the content of Divine Revelation is salvific as well, but the context of the passage is referring not to Revelation's content but to Revelation as a mode of transmission. For though, absolutely speaking, human reason by its own natural force and light can arrive at a true and certain knowledge of the one personal God, Who by His providence watches over and governs the world, and also of the natural law, which the Creator has written in our hearts, still there are not a few obstacles to prevent reason from making efficient and fruitful use of its natural ability. The truths that have to do with God and the relations between God and men, completely surpass the sensible order and demand self-surrender and self-abnegation in order to be put into practice and to influence practical life. Now the human intellect, in gaining the knowledge of such truths is hampered both by the activity of the senses and the imagination, and by evil passions arising from original sin. Hence men easily persuade themselves in such matters that what they do not wish to believe is false or at least doubtful. 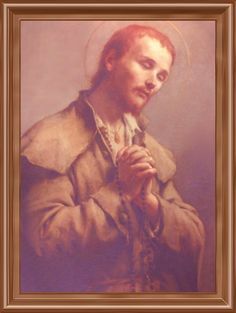 It is for this reason that divine revelation must be considered morally necessary so that those religious and moral truths which are not of their nature beyond the reach of reason in the present condition of the human race, may be known by all mean readily with a firm certainty and with freedom from all error (Humani Generis, 2-3). Once again, what is necessary for our salvation is the fact of Divine Revelation - because man is incapable of coming to the fullness of the truth with certainty by his own unaided reason, God has made a revelation of Himself to mankind, in the Scriptures but ultimately in the Person of Christ; the giving of this revelation was done "for the sake of our salvation." It is absolutely wrong and forbidden either to narrow inspiration to certain parts only of Sacred Scripture or to admit that the sacred writer has erred... For all the books which the Church receives as Sacred and Canonical are written wholly and entirely, with all their parts, at the dictation of the Holy Ghost; and so far is it from being possible that any error can coexist with inspiration, that inspiration not only is essentially incompatible with error, but excludes and rejects it as absolutely and necessarily as it is impossible that God Himself, the Supreme Truth, can utter that which is not True. 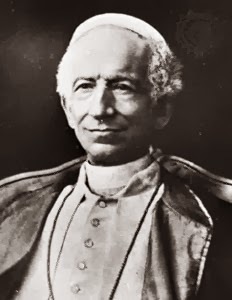 This is the ancient and unchanging Faith of the Church... [T]hose who maintain that an error is possible in any genuine passage of the sacred writings, either pervert the Catholic notion of inspiration, or make God the author of such error (Providentissimus Deus, 20).